Before President Obama gave up on labor law reform in 2010, the national AFL-CIO and major unions spent several years and many millions of dollars promoting “employee free choice.” Long-overdue statutory reform, based on this concept, would have allowed workers to unionize quickly without as much management interference in their decision to embrace or reject collective bargaining. Unfortunately, Trumka and the NLRB have just put the brakes on union balloting at a hospital in Chico, California that might have demonstrated stronger commitment to securing the fastest possible opportunity for employee free choice. Instead of the two-week wait promised under new NLRB rules—or even a 5 to 6 week delay more typical in the past—Enloe employees may not get to vote for months. Thanks to Trumka’s intervention, the Board’s still cumbersome election scheduling process, and the possibility of further legal snafus down the road, workplace democracy at Enloe is being thwarted, if not ultimately denied. How did Rich Trumka, labor’s leading critic of “unnecessary delay,” end up contributing to the problem? It’s because the AFL-CIO has a pretty big double standard where “employee free choice” is concerned. Organized labor wants fast, unimpeded voting when previously unrepresented workers are trying to unionize. However, if those same workers decide to change unions, their subsequent exercise of “free choice” is strongly discouraged and, in California healthcare lately, subject to widespread legal interference and NLRB foot-dragging. The Enloe workers fall in the category of the already organized. They first voted to unionize in 2007 but are now seeking a second vote—this time, to leave the Service Employees International Union (SEIU) and join the National Union of Healthcare Workers. The NUHW is a five-year old California rival of SEIU that was founded by some of the same experienced organizers who helped Enloe workers win bargaining rights and their first contract. About 8,000 of NUHW’s members are defectors from SEIU, while another 3,000 hail from previously unorganized workplaces. 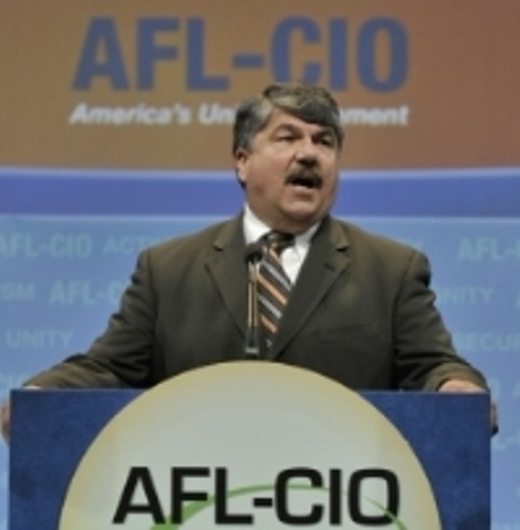 Normally, Rich Trumka would only ask the NLRB for time to address organizational misbehavior–through his federation’s own internal dispute-resolution procedure–if the unions involved were both affiliated with the AFL-CIO and covered by its so-called “no-raiding” rules. As many AFL-CIO unions recall with lingering resentment, the SEIU has not been a fellow member for ten years. In 2005, it broke away to form a rival labor federation that charged lower organizational dues but later fell apart. SEIU’s defection did have the benefit of saving its own treasury an estimated $150 million in dues money that otherwise would have been owed to the AFL-CIO over the last decade. Despite this financial history—or perhaps because of it– Trumka now seems very desperate for SEIU re-affiliation with the AFL-CIO. Last year, he and SEIU President Mary Kay Henry signed an “Agreement On Mutual Respect for Organized Workers. ” The main local goal of this bi-lateral peace treaty was to stem the flow of disgruntled California health care workers from SEIU to NUHW. Without paying a dime in back AFL-CIO dues or even promising to re-join, Henry got a deal that, on paper, bars SEIU’s own unhappy dues-payers from migrating to any affiliate of the AFL-CIO via a majority vote in their own workplace. The agreement, in effect, puts representation choices that should be in the hands of “organized workers” securely in the lap of top AFL-CIO and SEIU officials and their designated private arbitrators. In a memo to AFL-CIO Executive Board members before they ratified the pact last summer, Trumka stressed that these arbitrators would be “authorized to issue cease and desist orders” and their decisions would be enforceable in federal court. Employee free choice is mentioned nowhere in the three-page agreement about “Mutual Respect” signed by Trumka and Henry. Blocking elections–or delaying NLRB certification of the NUHW after it wins a contested vote–has been SEIU’s survival strategy in many California health care units. Last March, for example, another group of 700 unhappy members of SEIU’s statewide United Healthcare Workers (UHW) local revolted at Seton Medical Center, in Daly City south of San Francisco. Their beef was similar to the complaints of UHW members at Enloe. Three years ago, SEIU/UHW negotiated a contract riddled with costly pension and health plan give-backs affecting workers at Seton and five other Daughters of Charity hospitals. To secure membership approval, SEIU gave workers few details of the settlement and only nine hours advance notice of the ratification vote—a breach of the union’s own constitution. Two years after this bargaining fiasco, Seton workers voted to replace SEIU with NUHW. The incumbent union appealed the election results, while continuing to collect dues but doing little to improve its day-to-day worker representation. Finally, on March 19 after a year-long investigation, the NLRB’s San Francisco regional office dismissed SEIU’s post-election complaints, finding them to be frivolous and not even worthy of a hearing. The AFL-CIO’s current complicity with SEIU’s “captive membership” approach in Chico is not only hypocritical and counter-productive; it’s way out of synch with the better union responses to current labor law trends. Some U.S. labor organizations are belatedly realizing that they have to be far more responsive to the collective concerns of rank-and-file workers. Those that remain out-of touch—and overly reliant on automatic dues deduction– will lose many members as more Republican-dominated courts or state legislatures make worker financial support for unions completely voluntary. Already, unions representing private and public sector employees in Indiana, Wisconsin, and Michigan–plus publicly-funded homecare workers in Illinois and elsewhere—have been forced to adapt to this challenging new “open shop” environment. For better or worse, they must now compete for the loyalty and support of individual workers in bargaining units where payment of union dues or “fair share” representation fees can no longer be compelled and/or collected through pay-roll deductions negotiated with the employer. When workers feel collectively trapped in poorly performing unions that do not properly represent them, the most union-minded among them often believe that changing unions is their only hope. If switching to another union is not a viable option because of AFL rules or incumbent union manipulation of Labor Board procedures, the result will be more workplace anger, frustration, and resentment. And that rank-and-file alienation can, over time, morph into anti-union sentiment and personal refusal to fund union activity, when and if “open shop” conditions permit. It would be a far healthier stance for organized labor to embrace “employee free choice” consistently so representation decisions made by majority vote are respected, not thwarted at Enloe, Seton Medical Center, and any other place where the failings of one union might be corrected by its successor.